It seems so long ago that I took my 1966 Bultaco Mercurio 175 apart. It is not making progress. I'm pretty sure I did nothing to it in 2016. It's time to surrender. I researched some shops, and I think I've found one that will work. He's been building bikes for 25 years, and he seems pretty fired up about my project. Pulled it out of the garage yesterday. I'll trailer it over to his shop next weekend. And, when did you last drive your '02? Huh? Huh?? No - it won't run. It has no electrical harness at all. Carb is all out of tune. I think there is a problem with the clutch or the transmission. I've done a lot of work, but a lot more work needs to be done. Well, good that progress is being made. I'm going easy on ya now! Good hearing from you Ken! Yeah - it seems like time is just getting harder and harder to manage. Over Christmas, I took 2 weeks off, and did zero in the garage. For 2018, I'd like to drive ALL of the stuff more. I'm still waiting for you to post an update on your Porsche. sure looks nice! hope it is done for riding season! i took a week off over the holidays. left for work each day around 11am, came "home" at 5pm. "work" in this case was my shop. it was awesome twisting wrenches on multple projects for a week straight. rarely get that chance. the 911 is frozen behind my house in a trailer with my spare K75S. Looks like you poor saps in the NE are about to get blasted again with more snow... good times. 'Twas a glorious day here in CenTex. Barney and I trailered the CS to the media blaster. Hope to have it in the paint shop late Friday for primer. Wait - CS? When did this happen. I think I'm also going to take all my body panels for my R90/6 to paint, and have them all painted flat black, and have a red pinstripe added to the tank. That will look nice. 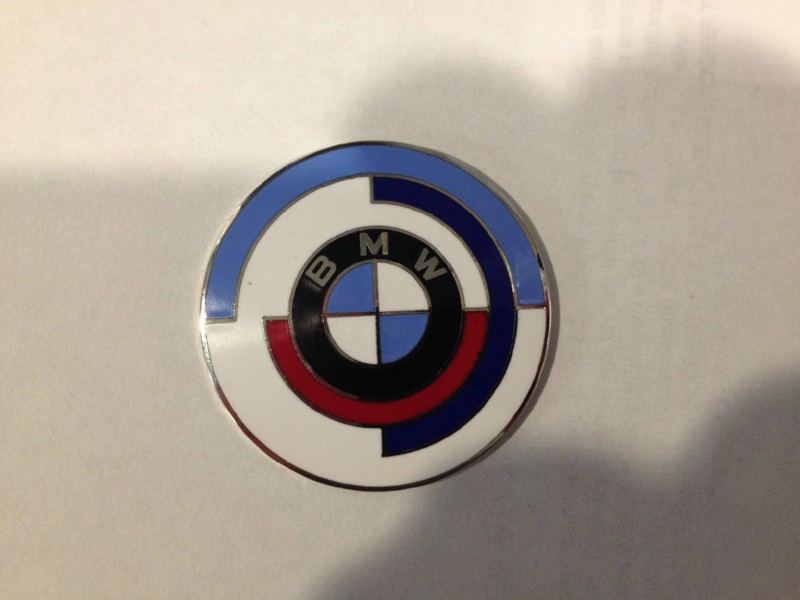 I also found some 70 mm motorsport roundels for the tank that will be very nice. Msport Roundels on the tank. That'll be interesting. Greg is having his dad's old airhead re-worked up here in Austin. It's a pretty cool early bike and sidecar. Very nice. Did BMW Motorsport ever work on the bikes? I have no idea. But it will look nice, won't it? I like those. They will look good. Well - almost ready to go. Bultaco is in the backyard, spare parts are next to it. I was able to pretty quickly pull the body panels off the BMW R90/6, and it's all ready to go too. It's exciting getting everything moving.